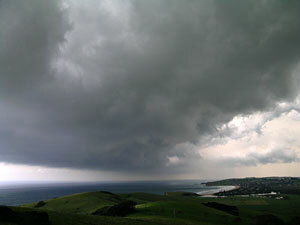 A four shot panorama of the storm over Lake Illawarra. The sun was visible through the rear, hence the wide contrast. Marginal days are easily overlooked, sometimes to the extent that some little key indicators are missed. Today was such a day. An unexciting surface chart, weak broad trough and marginal indices such as Lift Index and CAPE had me dismissing the day before it even started. What did I miss - very humid coastal air, a weak upper trough and a fairly decent wind speed shear. 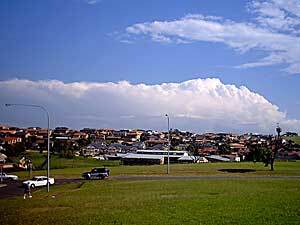 At work around 2.30pm I looked towards the SW and was surprised to see a small cell developing about 100kms away. I checked the radar and this cell was not showing anything at this stage, but what did take my attention was a storm just north of Batemans Bay, about 150 kms S/SW. Over the next two hours the storm worked itself up the coast. 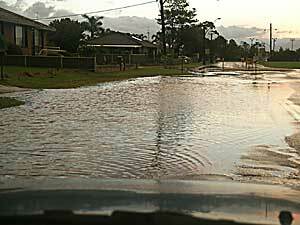 By 4.30pm it was near Nowra and I could no longer resist, so I knocked off work and headed southwards. It was evident that wind shear was strong - as demonstrated by the photos below courtesy of Stephen Jarret ( Lightning Chaser ). There are two things I like when I see a storm like this. Firstly, the evident wind shear, and secondly, the lack of other storms. Storms in strongly sheared environments often do not look that impressive, but I will gladly swap a pulse bomb for this anyday. A gust front quickly outruns it's parent storm and stalls just north of me. I made my way southwards down the coast, at Mount Pleasant south of Kiama I finally came close enough to pull and take some photos. A large detached gust front was moving up quickly from the south, in fact so quickly that over the next 20 mins it outran the parent storm by some 20 -30 kilometres. At this stage the decaying storm back south held no more interest for me...what did interest however was the gust front, which had now stalled. Humid NE winds were converging into this stalled outflow boundary. 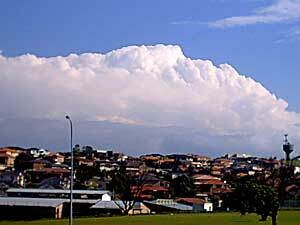 I knew that this boundary would be the site of a new storm, so headed northwards. From here on things happened rather quickly. 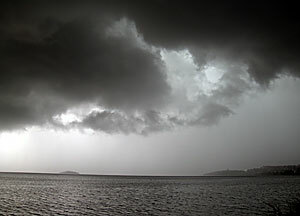 At Lake Illawarra a huge rain free base loomed overhead. To the west the sun was visible through a curtain of heavy rain. The lightning became very intense with bolts every few seconds within a kilometre radius. The updraft base began to be cut by intense rain from the west, I suspected that some RFD action was causing this. As the RFD cut in, some weak circulation developed and rain curtains at one stage displayed differential motion. 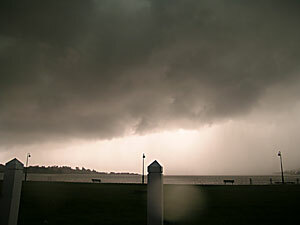 Then the intense heavy rain and wind enveloped me. I tried in vain to move ahead of the storm, but it was moving far too quickly. 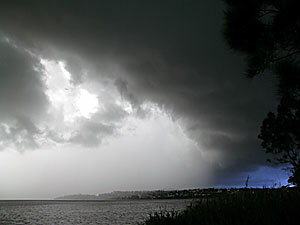 Localised flash flooding occurred in around the suburbs surrounding Lake Illawarra, there was some minor tree branches down, but no serious damage. At this stage lightning strikes became very intense and frequent. Cloud motion was significant.